8 nights in the van … it’s getting better. 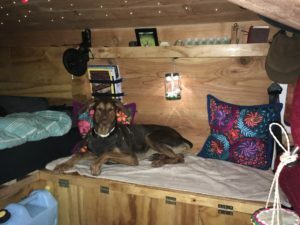 Vanlife… a cozy home on wheels. Clean and organized with just a few belongings put away neatly into sparse storage… As if… we are still so far away from that. Reality caught up fast when we moved into our rusty, old van. We own way too many things. So we sorted through everything once more and got rid of stuff that seemed important before. Than we shifted it from a to b and again to a just to realize that it’s still too much. Bulls***!!! And while the dogs trampled on our feet and the air inside got thinner a huge pile of clothing and weird stuff accumulated in the car and on the street. That’s all us? No way. 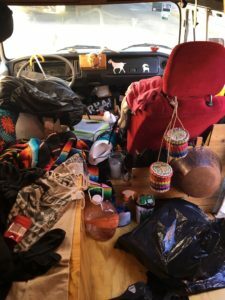 Frustration took over and living the vanlife on the open road seemed out of reach. 8 days later we are still sorting through. But it gets better. Way better. And thanks to the wonderful support of uncounted new friends we are still able to take a shower and use the bathroom and we could fix some more issues on our Rusty Old Van. Stay excited! !